Kenny Ortega, the choreographer/director responsible for turning footage of Michael Jackson's last concert rehearsals into the documentary movie "This Is It," has reportedly signed on to adapt the iconic music video for Jackson's 1982 song "Thriller" into a full feature length film. The filmmaker, who oversaw preparations for Jackson's planned "This Is It' tour," is due to get behind the camera for the new film version, reports Deadline.com. "The Hangover's" Jeremy Garelick is writing the movie's screenplay, and Rod Temperton, the man who wrote the song, is also involved. 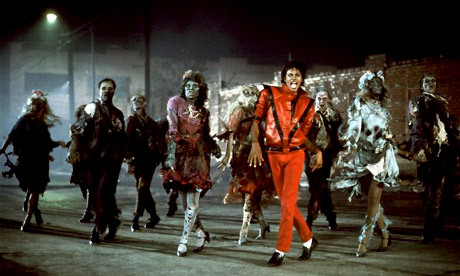 The original 14-minute video, which saw Jackson leading a group of zombies through a now infamous dance routine, was originally shot by director John Landis and is often considered to be the greatest pop music video of all time. According to the UK's Guardian newspaper, the makers of the "Twilight" series of films are interested in buying the rights to the film, as are Lionsgate and Twentieth Century Fox. There is currently no word on when filming will begin.